The Quality Assurance ("QA") Provider Credential designates that an organisation has the necessary qualifications and certifications necessary to perform an ICP Quality Assurance Review. Credentialed ICP Quality Assurance Providers play a crucial role in the ICP System and provide third party verification that projects are compliant with the ICP Protocols and can be certified as an Investor Ready Energy Efficiency™ projects. The ICP System requires that QA Providers be independent third-parties to the particular transaction, thus ensuring that there is no conflict of interest associated with the review. QA Providers leverage the ICP Project Development Specification, the ICP QA Specification, and the ICP QA Checklists to ensure a thorough review process. Upon completing a successful review. QA Providers sign the completed ICP QA Checklist and register the project thereby certifying the project as an Investor Ready Energy Efficiency™ project. 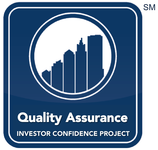 Investor Ready Energy Efficiency™ certification brings a new level of investor confidence in projects' underlying engineering and reliability of predicted savings. Please visit the ICP Quality Assurance Process and Tools page for more information on how QA Assessors are integrated into the ICP system. Has an engineering or science degree, and a nationally or internationally recognised certification, which is relevant to energy in buildings (e.g. CMVP certification, EPBD energy assessor certification) - these qualifications will be reviewed on a case by case basis. Complete the ICP Project Developer Credential training and Quality Assurance Assessor training - at least one member of the technical/engineering staff involved on the project must attend these sessions. Interested in becoming an ICP Credentialed QA Provider? Provide evidence of relevant continued professional development activity (for example, attending conferences, attending courses, producing papers) - these would be validated on a case by case basis.